You know those packs of tomatoes you get that are beautiful shades of red, yellow and orange? Those are what we’re looking at today because they look – and taste – amazing when they become a tomato galette. If you’re not familiar with the world of galettes, they come from rustic and rural French cooking. Think farmhouses in the Dordogne, bistros in the streets of Bordeaux and the rolling hills of Champagne. They’re like a pie but without nearly so much hassle. It’s a pastry base that rolls up the sides and over the edges so you get a crown of golden pasty that is filled with your fruits or vegetables of choice. At this time of year, tomatoes are in season and the depth and range of flavours is something that’s a total joy. If like me, you’re in the camp of weirdoes who can’t stand eating raw tomatoes but love them cooked, then this is the perfect recipe for you. 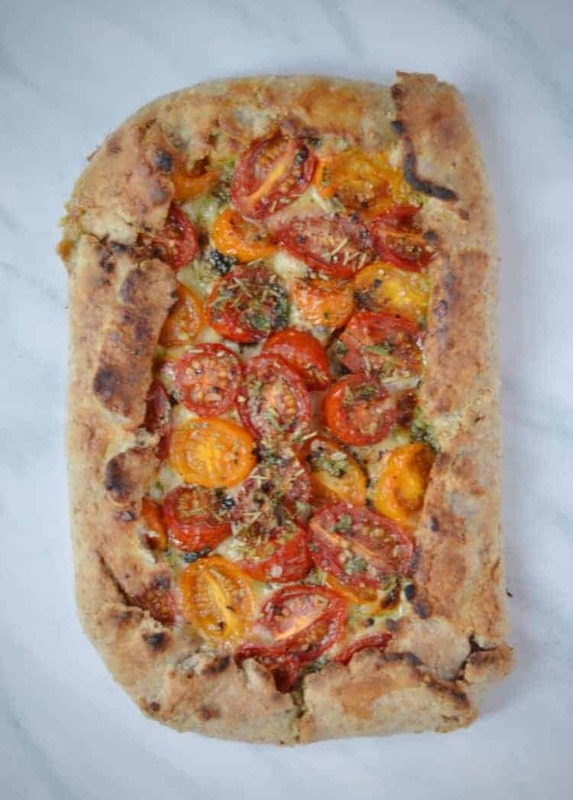 If you think that last sentence has lead you to a world of tomato-haters you never knew existed, don’t worry this recipe is still very much something you need in your life. 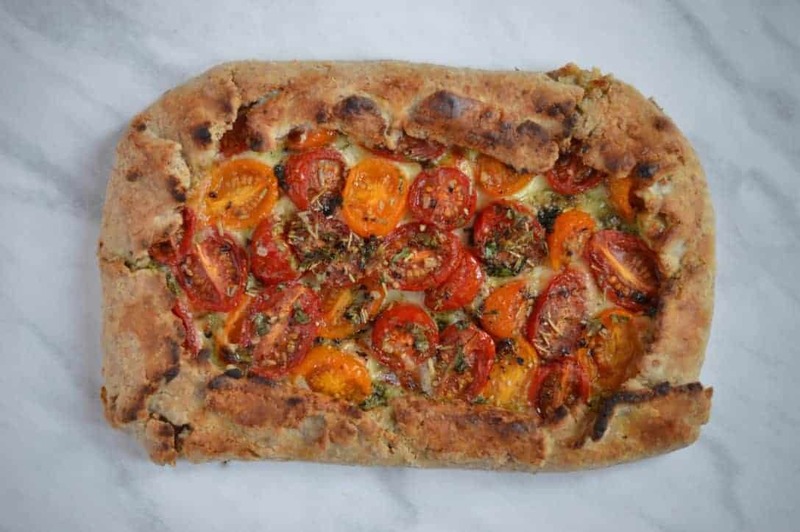 Making a tomato galette is the perfect way of making the most of peak-season tomatoes. 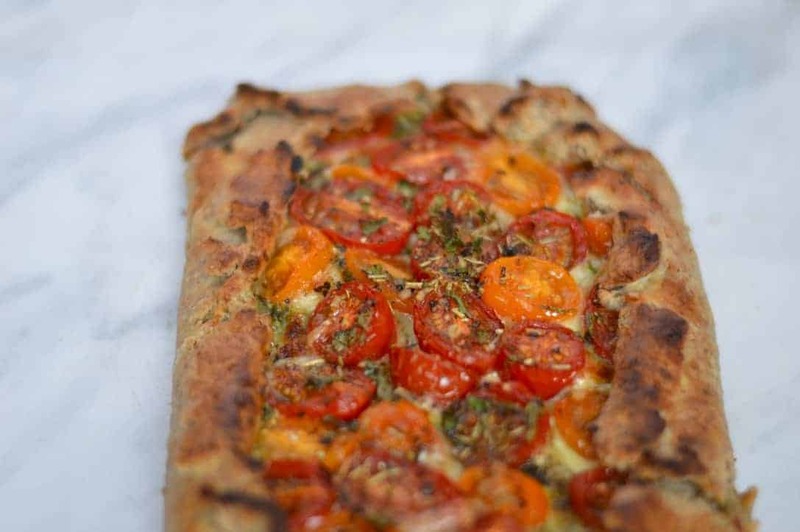 Whether you’re making it for a lazy lunch or serving it up on a terrace alongside a big green salad, a tomato galette will go down a treat. It’s not something you see every day, but once you share it with the people in your life you can be sure that they will be asking for the recipe. 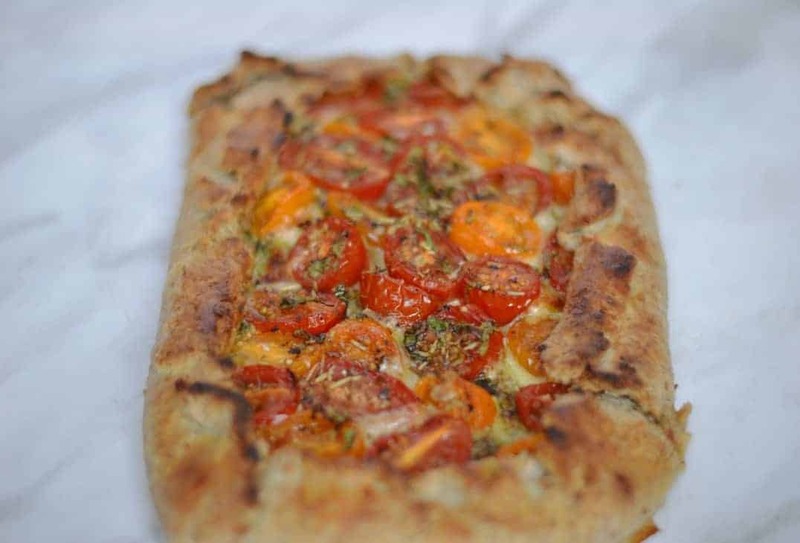 The maximum flavour version of this recipe uses a homemade wholemeal pastry and lots of herbs. But life doesn’t always work like that and if your options are shop-bought pastry or no galette, then by all means go straight ahead and get that galette in your life. Sure the party won’t be quite the same, but to hell with the haters. 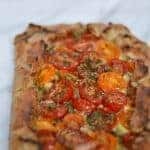 Summer is a brilliant time for galettes, and this tomato galette makes the most of all the tomatoes at their best. 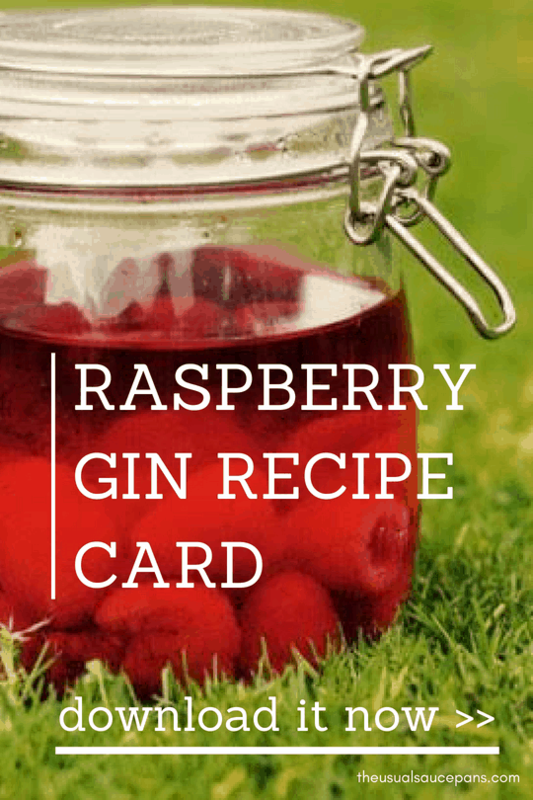 You can serve this up on its own, as part of a buffet or with a salad for dinner. Serves 2. Make your pastry by mixing the flours, salt and butter together in a large bowl with your hands, rubbing the butter through your hands to rub in the flour, until it reaches the consistency of breadcrumbs. Slowly add water (a tablespoon at a time) to the mixture, mixing each spoonful through, until it comes together. Then knead with your hands for a smooth dough (you can also do the kneading on a floured work surface, but this way involves less washing up). Put in the fridge for 30 minutes to chill. Slice all your tomatoes in half so that they can roast evenly in the oven. Roll out your pastry to your desired shape and so it is about the same thickness as a £1 coin. Scatter the breadcrumbs across the pastry, leaving about 5cm around the edges. Grate half your parmesan on top of the breadcrumbs and then pile all your tomatoes on top. Season well and cover with the herbs and remaining parmesan. Tear the mozzarella into pieces and push between the gaps in the tomatoes. Fold the edges that are unadorned up and over the edge of the tomatoes to create the sides and lid. 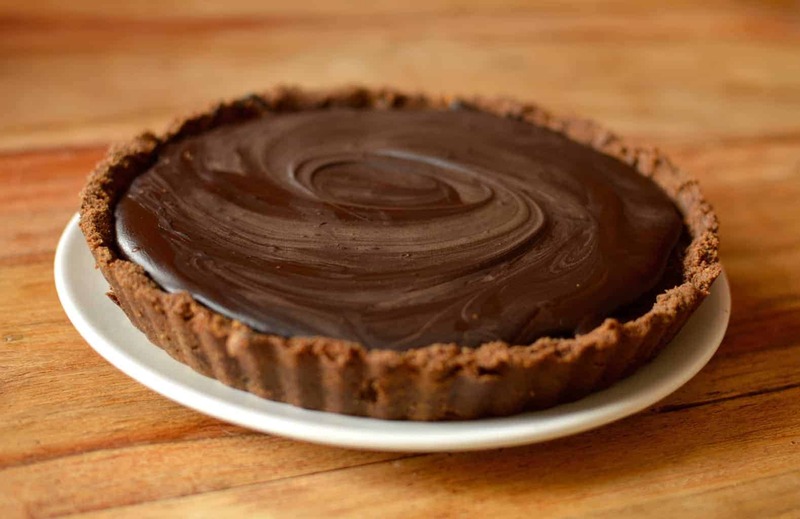 Bake in the centre of the oven for 30-40 minutes, or until the top of the pastry is a dark golden brown. Serve immediately.